This was my 3rd show on the Licks tour (Barcelona, Astoria and Zaragoza) and probably was the best ! The site was really uncommon. The stage was located in a big parking lot outside the Zaragoza fair, you could see all the traffic speeding towards Madrid on the road and also some planes landing at the nearby airport. Since there wasn't any high fences arround people in the car park and even on the highway could see and hear the concert through the big screen ! I was lucky enough to get my 120 Euro ticket and I got a really got spot in front of the stage almost as good as the Astoria show ! Rubt Tuesday was the beginning of a really great "guitar show". Midnight Rambler was super with all 4 Stones looking very relaxed and smiling all the time. Introductions were done in Spanish and the joking with Ronnie was hilarious. Jagger said in spanish " ... I am kind of sad now because this is our last show in Spain ... for the moment ! " At the very beginning of the B stage songs it started to rain a lot but they didn't seem to notice at all ! Rain stopped after Street Fighting Man. They changed clothes constantly, they joked with each other all the time, they riffed and danced for two hours. We love you Stones ! After Barcelona i was really looking forward to this last show in Spain where the crowd really do appreciate a good party atmosphere. After a couple of days in Barcelona getting in the mood we headed by train to Zaragoza, a place i think is not really on the tourist route, (part of the appeal). Five hours later we arrived and got quickly into the town and found the free buses to the venue. Good atmosphere prevailing with the infomal vending arrangements outside! Primal Sceam passed without incident and by the time the band took the stage the place was in good mood. However i would say this was a good rather than a great gig. There was lots to admire, (as always) for me Midnight Rambler was the highlight. The mostly standard setlist was helped by a lovely Ruby Tuesday and all the other tracks were excellent also. Keith was a rock throughout, but Ronnie was away, away, away, unfortunately. 2. I heard CYHMK twice, (with Ronnie on form) so can't complain. 3. Keith is so "Las Vegas" and is really on top of his game - big time. Great show in Zaragoza, among about 30,000 fans. The venue is not the better place at all to perform a concert. Just the parking of the Exhibition Centre. But it was no problem for me and my friend Ivan, as we drove 350 kilometers from Bilbao to attend to the gig. Organizers prepare free buses from several points of the city to reach the place, as it is out of the city, near the airport. Good. But total chaos happened after the show, when people had to wait two long hours to take the bus back the city. Doors were opened at six o� clock as a very long queu was ready to enter the place. At eight o� clock Primal Scream started their performance. I think they showed their good psychodelic r&r, hard (three guitars on stage), but people did not know them. At 21:45, though people not were as enthusiastic as they were in Bilbao, after several Oe, oe, oe!, Brown Sugar burst into the air and people went crazy with the most shocking telecaster of the world. YGMR and DS kept the fans rocking. After those two, Mick in spanish, �now we are going to relax� and YCAGWYW and a quite good Miss You with Mick leading people in the famous �uuuuuhhh� chorus of this song. Mick, dressed with a light blue t-shirt whit no sleeves, made the statement of the night in spanish, �we are sad because this is our last show in Spain� for a while�. Next was a long and marvellous midnight rumbler, in my opinion, the best song of the night and a sweet taste of classic rhythm and blues all over the air. Before introductions, TD, as nice as always. 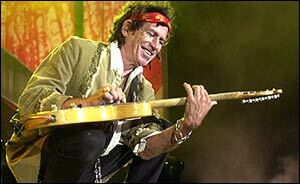 Keith�s songs were Slipping away, I think he sang very well and he reached that personal and intimate touch that this song is supposed to offer, as long as it can be reached in the vast open-air parking of an exhibition centre. BTMMR, good, although some people in the first rows shout �Happy� before Keith started the song. The second part of the show went on with Mick in a black levite embroidered with red ready to perform SFTD, one of the moust danced by people, just when it started rained. Next, the band cleared the way to the small stage, not very far from the main one this time, under a refreshing shower. But the rain was not so far a problem as a big umbrella was set up in the B stage (mainly for Charlie�s drums), Mick put a silver hat on and Ronnie a waterproof. In the end, IORR, the so loved in Spain LARS and SFM under the rain made a lovely set who remembered me their show in Madrid in 1982 during a hot stormy night. At this point, sound was not good as it expected to be, at least from my position in the front of stage area, Keith�s side. Back to the main stage, GS, and Lisa, as good as always, delighted the audience with his voice and his brown, lether mini skirt. The final part of the show was just what everybody was looking for, SMU, HTW and Satisfaction under the red confetti snow. 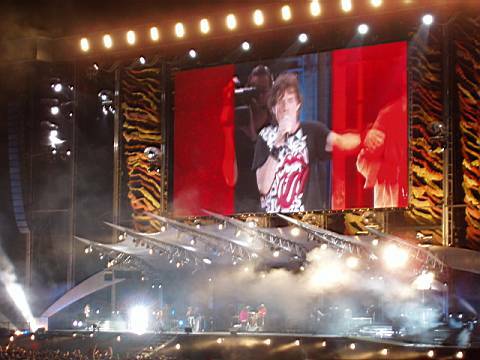 JJF was the beloved rocking and expected encore, to close the two hours show. I hope this won�t be the last show under the Pyrenees because I feel like old gods never die. What can I say, I know it�s only r&r, but I love it. Thanks to Manuel Meneses and Miguelon for photos! Thanks to Jordi Colell, Iris N�lle-Hornkamp and Miguelon for news links!